Strategies for increasing the flow of immigrants to southwestern Pennsylvania have been gaining ground in recent years for good reason. Although the immigrant population has been trending slightly upward in recent years, the Pittsburgh Metropolitan Statistical region still finds itself near the bottom of the nation’s metro areas in workforce diversity and foreign-born residents. That wasn’t always the case. Immigrants accounted for a quarter or more of the population in the decades when steel and mining matured to dominate the region’s economy. The City of Pittsburgh is a good example. 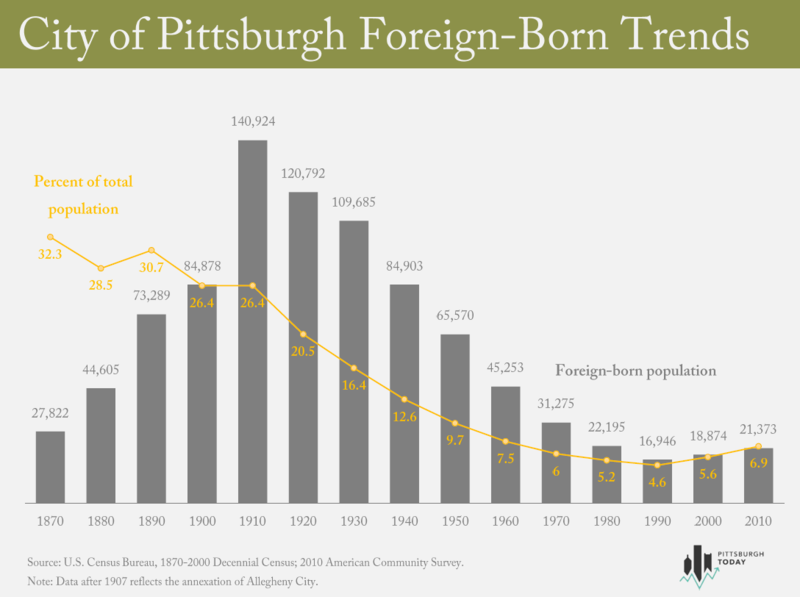 The chart below illustrates the trend that took the city from a popular destination for immigrants to one where the current mayor, Bill Peduto, recently unveiled a strategy for attracting and retaining foreign-born workers and families to help shore up population and improve the outlook for economic growth.